Taken on the Icefields Parkway 34km (25 min) north of Lake Louise. A century ago, there were three "toes" of ice here. What a wonderful gallery on Alberta here, which brought me a lot of great memory in Alberta. Thanks for sharing! A magnificent shot that almost feels like two different images: the sun has brought the mountains and snow to life, while the road and foreground with its shroud of fog seems still to be asleep and full of mystery. Breathtaking. It looks so serene and peaceful. Masterful shot Gary. What a photograph. I just looked at it for 15 minutes, stunned. This is terrific Gary, The fog makes it. You ar very lucky ! Je veux faire un photo comme c'a ! Tres jolie!Mercie de ta visite et des bonnes mots. Now this is a spectacular image. It causes me to forget the distinctions between a photo and a painting. It's almost both. Now this is a spectacular image. I causes me to forget the distinctions between a photo and a painting. It's almost both. Excellent work and super nice area there. So glad you got this, it's wonderful. Love that low lying fog and the light on the mountain. Wow so spectacular and awesome!! Really cool shot of a magnificent area! One of earth's treasures! Perfect time, perfect place, perfect lighting, perfect shot. You got a vote on this one. I've been in Canada too and I did like the nature scenery. I can watch to this photo for ours!!! The 'feeling' here is breathtaking...bravo! This is a unbelieveable shot Gary! This could be the mountain Pilatus in Switzerland! Yo're great fotografer! I wish we could go together for fotoshoting one time . I like them all, but think this is my favorite. The contrast of fog and rock, the way the composition leads into the distance. Really a nice photo! This photo could take my breath away! Amazing photo! You were in the right place at the right time, but more than that, you have the talent to capture this beautifully. Wow. Words aren't enough for this one. 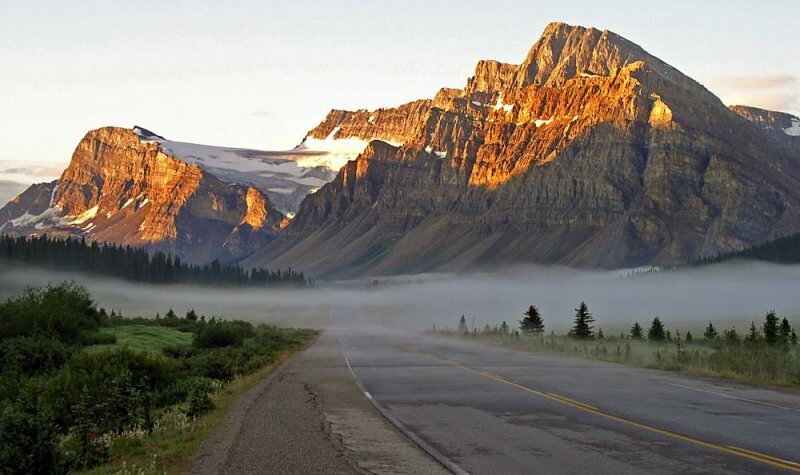 this is something everyone dreams of when travelling the rockies ! Yup - rounding the corner and seeing this will make you stop in your tracks! Great shot, and what a beautiful place! Awesome. I love the transition from fog to sunshine.